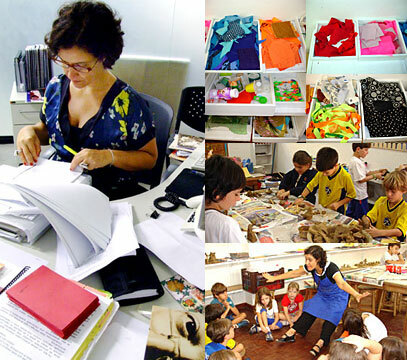 Stela Barbieri is the curator of the Educational Project of the Sao Paulo Biennial Art Exhibition. She began this work at the 29th Biennial Exhibition in 2010 and today she is developing the educational project for the 30th Biennial Exhibition, which will be held in September 2012. In 2011, she implemented the ongoing education project of the Biennial Foundation and worked as the educational curator of the exhibition entitled "On behalf of artists." She is the Educational Action director of the Tomie Ohtake Institute, where she coordinates the public relations services, the "Espaço do olhar" course center and the course center for teachers, children and adolescents. She coordinates the support to exhibitions and the publication of material in the educational project. Stela has worked as an educator for over twenty-five years in Vera Cruz Experimental School, where she currently holds the position of arts advisor for early childhood education and elementary education (first cycle). She also works as an arts advisor in Castanheiras and Nossa Senhora das Graças schools. From 2000 to 2005, she took part in the "Escola que Vale" ["The Real School"] Project, coordinated by CEDAC [Community Education and Documentation Center], where she developed special classes for improving the teaching of arts in public schools, in different parts o Brazil. Since 1994, Stela has been working as an art, education and literature advisor in the Escola no Cinema [School in the Movies] Project at Unibanco Cinema Center since 1994. Read more about the direction of projects at Tomie Ohtake Institute, about the advisory services and courses/lectures.